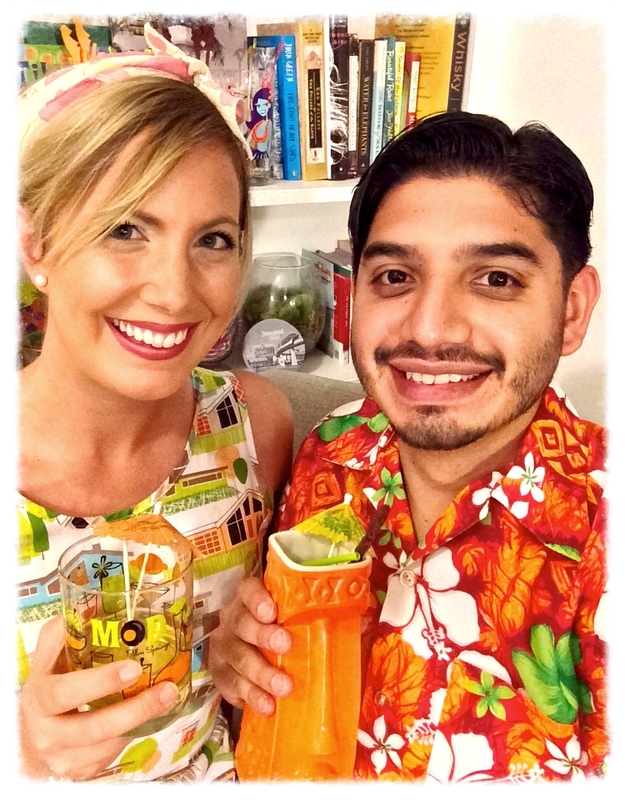 Let's be honest, we made some pretty terrible tiki drinks when we first started out! Some were good but many ended up (sadly) getting poured down the drain. While we love frequenting tiki bars & events, we're still fairly new (in comparison to many other tiki folks) at mixing our own drinks at home. Over the past few years of practice and exploration, we've certainly improved quite a bit but we still have a lot to learn. In general, tiki drinks are complicated and take time and patience to fully master...not to mention, it really helps to have a thorough knowledge of rum that (in our opinion) takes years to fully grasp! When we first started dabbling in home mixology, we made our fair share of cringe-worthy mistakes and we're not afraid to share them (since we think a lot of other people have probably been there too). For any of you just starting out, do yourself a favor and learn from our screw-ups. By avoiding the items on the list below, you'll be on your way to making great tiki drinks in no time! Let's start with this one because this was easily the number one mistake that ruined a lot of our drinks. Just about every tiki drink calls for freshly squeezed lemon or lime juice. When we started out, we didn't feel like always having lemons and limes on hand so we came up with a substitute: Rose's Lime Juice. Rose's Lime Juice is neither freshly squeezed nor is it pure lime juice. It is a sugary syrup that can really throw off the flavor of your drink and make it too sweet if you substitute it for the real thing. The next thing we tried was bottled lemon and lime juice from concentrate. Again, those ingredients destroyed our drinks! Finally, we gave in and realized that, yes, the authorities on tiki drinks know what they're talking about. Nothing is a substitute for freshly squeezed lemon or lime juice. And, really, it's not that hard (or expensive) to add a few of these fruits to your weekly shopping list. When we can, we also buy fresh grapefruits and oranges for the same purpose. When we started out, we didn't realize just how much precision is required when mixing tiki drinks. A little too much or too little of one ingredient can ruin an otherwise good drink. And boy, did we find that out the hard way. The first jigger we owned to measure out liquid ingredients didn't have any measurement markers inside. As newbies, we had no clue where 1/2 or 1/4 of an ounce fell and we just guessed (wrongly). As a result, none of the recipes we made turned out right. Since buying this jigger, we've been on the right track. 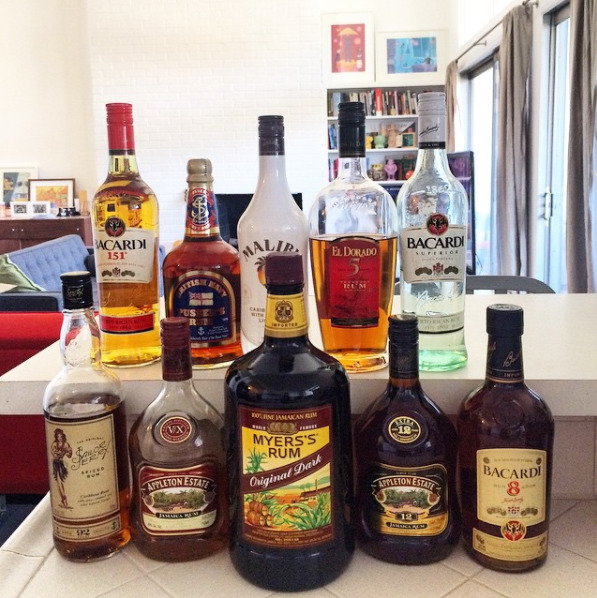 When we started making tiki drinks, we already had a decently stocked bar (at least for 20-somethings). We assumed we would basically just need rum (we had a bottle of Bacardi) and some fruit juice, right? Wrong! We quickly realized that it was nearly impossible to make ANY tiki drink with what we already owned and that we had a lot of work to do in order to build up our ingredient arsenal. We had read that it was smart to purchase your ingredients for one recipe at a time. As mentioned above, we started basically at zero. When we would head to the store and go down the list of items for each potential recipe, some were quite obscure and the cost to buy everything we needed to make one drink was always through the roof. Not to mention, the times when we would look for a drink to make with what we DID have, there were only a couple of recipes that we were equipped for. For a few months, it felt like we were treading water. We got incredibly frustrated and wished there was some guide that specified all of the most common tiki drink ingredients so that we could stock up on the basics that we knew were going to get used. We think buying per recipe is a great idea when you have already have a baseline of ingredients; otherwise, this method can get really frustrating. When you're starting out, it's especially hard to discern which ingredients are specialty items that are rarely used. We've found that it's better to purchase about 25 basics and add the other items slowly as you come across new recipes you'd like to explore. 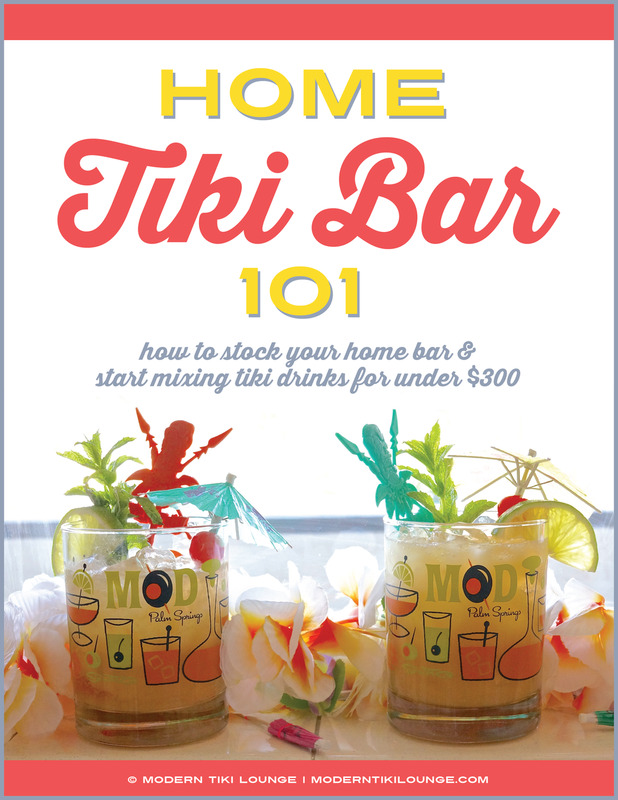 Our suggested list of tiki bar starter ingredients can be found in Home Tiki Bar 101. When we were new to tiki drinks, we didn't realize just how many types of rum there were out there. The list is enormous and each tiki recipe calls for very specific rums....for a reason. When our stockpile of rums was limited, we would often substitute here and there, which resulted in, you guessed it, terrible drinks. A light rum is not a Demerara rum and a dark rum is not an amber rum. If you substitute one rum for another, you'll end up making a very different drink...and it probably won't taste quite right. As we mentioned above, we were super frustrated each time we flipped through recipe books and couldn't find a single drink to make with the ingredients we had available. Once we discovered Jeff "Beachbum" Berry's Total Tiki app, everything changed. 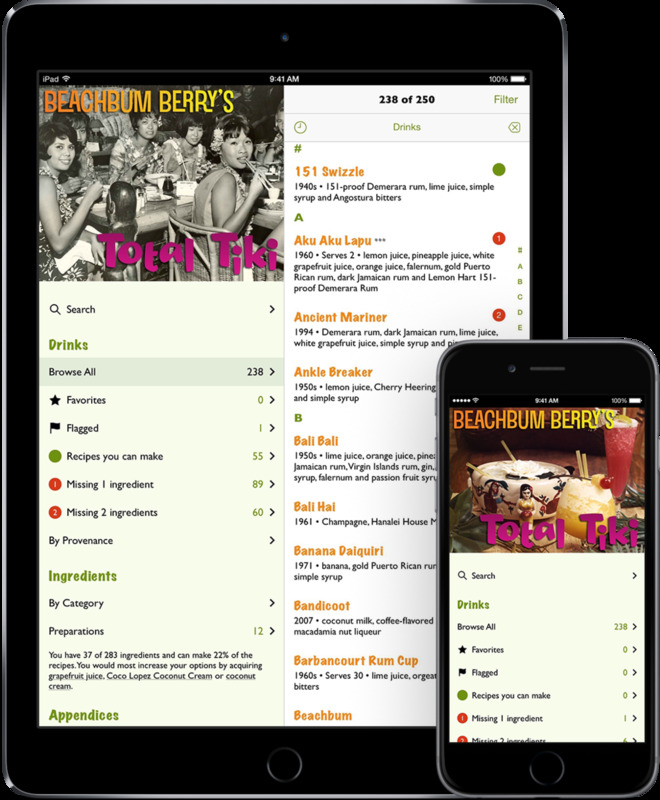 After inputting all of your home ingredients, the app tells you which drinks you can make with existing ingredients (or with the purchase of just one or two more things). You can also see how often ingredients are used in recipes to help you decide if they're worth the investment. In terms of substitutions, sometimes there ARE exceptions when you can use one rum instead of another. Luckily, this app will let you know when you can do that, which is awesome. 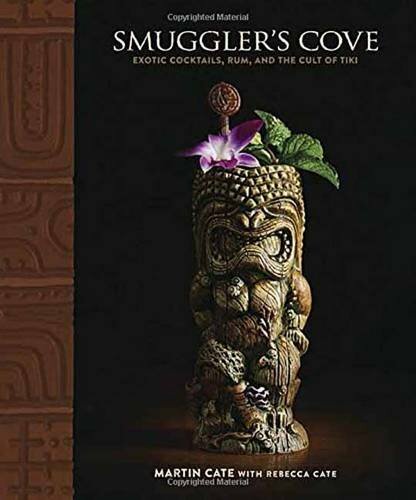 Total Tiki has been a lifesaver as we build our collection (and it's another recipe "book" we can't live without). When we started out, we had been to a few tiki bars but we hadn't really explored all of the classics to know which ones we liked or didn't like. As a result, we made some drinks at home that we really disliked. This is bound to happen but we might not have wasted so much of our time and ingredients on them if we had a little more knowledge about tiki drinks in general. It wasn't until we finished the Grog Log at the Tonga Hut that we had really wrapped our heads around the types of tiki drinks (and ingredients) we prefer. For instance, we've realized we're not typically fans of blue drinks and those that contain grenadine. If you're semi-new to tiki, get out there and thoroughly explore the drink menus at your local tiki bars! Ice is considered a crucial ingredient in tiki drinks because of the way it interacts with the liquors and juices. If it's not used properly, cocktails don't taste the way they should. Sometimes the difference is barely noticeable and sometimes it's extreme. We now buy our ice in bulk but when we only had a two trays in our freezer, we often didn't have enough cubes to properly chill and dilute our drinks. They were too strong and not super pleasant. When we started out, we didn't really shake our drinks hard or long enough. As a result, they weren't properly mixed, chilled, or diluted. Shake for about 15 seconds or until the metal of the shaker frosts to know you've given your drink the right amount of time. To really froth things up, make sure those shakes are vigorous, too! Out of all of the items on this list, we actually think this one is FINE! Over the years, we've gradually worked on upgrading our rums and other ingredients...and we still have a lot of progress to make. That being said, we had to start somewhere (and it was expensive to buy everything to reach a baseline at first). So for this one...#sorrynotsorry. We still make a mess every time we mix our drinks and we still have a lot to learn when it comes to quality rums but we're getting there! That being said, we've mastered the basics and have mixed up tons of tasty tiki drinks in the process. If you're just starting out, we've got a special guide for beginner's in the works just for you that covers all of the advice we wish we had gotten a few years back. Find out more by clicking the link below! 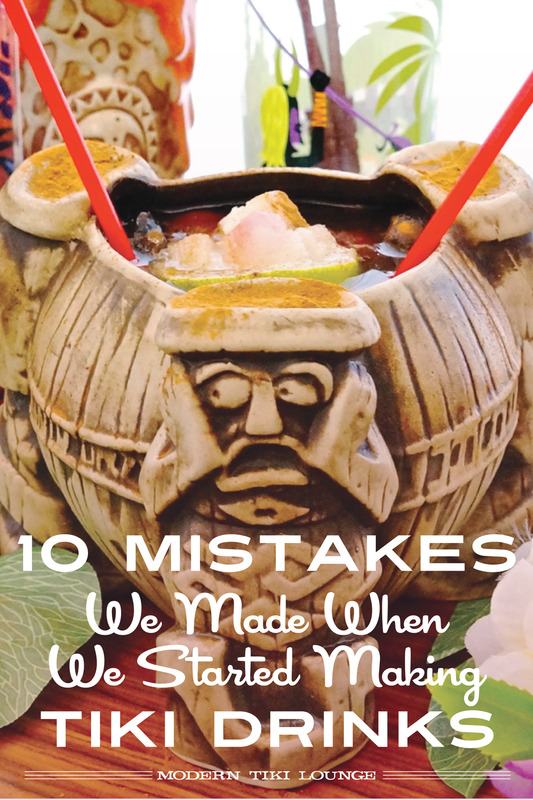 Anyone else willing to admit to some crazy mistakes you made when you first began your tiki journey? Let us know in the Comments section below!